1 أوقية مصنف إليميتال T-206 البيسبول سلسلة سبائك غريتس الفضية Purchase your 1 oz assorted Elemetal T-206 Baseball Greats series silver bar from our shop online for the lowest price on the web. Each silver bar in this series pays tribute to one of the iconic baseball players of yesteryear by boasting imagery from history’s most popular baseball card series. 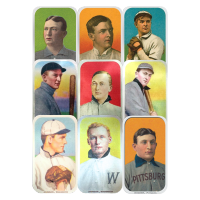 The bars in this series bear designs from the sought after T-206 baseball card series, issued with 16 different American Tobacco cigarette brands These cards are serious collectors items today due to their full color printing and their extreme rarity. The obverse of each bar mimics the cigarette packaging in which the bars were contained, while the reverse of each release will bear a different, sepia toned image of one of the baseball greats of the era. The right side of each bar will contain imagery from one of three different baseball cards in the T-206 series. All bars will be numbered and released under seriously limited mintage, likely to be snatched up by baseball lovers, card collectors and investors alike. Be sure to order your 1 oz assorted Elemetal T-206 Baseball Greats series silver bar today so that you too can become a part of the all-star team!